Luis Scheuermann was born in 1970 in southern germany in a little village in the Odenwald forest, where he did his first contacts with nature already as a child, when his grandfather as a huntsmam shows him the outdoors. His first journey on his own brought him to the wild and beauty highlands of Scotland. There he found his passion to outdoor-photography with his first analog point-and-shoot camera. His interest for getting to know the processes of nature took him to the study of ecological biology at the university of Bayreuth / Germany. Here he could profund his knowledge about nature and ecology. His special interest are insects and spiders and so he discovers the world of macrophotography as a special field of nature photography. His work as a tropical ecologist took him to East-Africa and many times to Southamerica, where could admire the inumerous wonders of magnificent landscapes and a megadiverse wildlife. He lived for several years in Brazil and became an expert for this marvelous country with all his still virgin nature in many places. But also the massive destruction of vast landscapes and all the problems which come along with that is part of his interest. 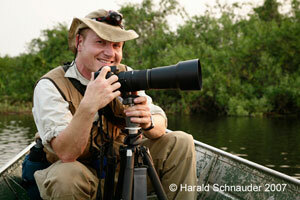 Luis Scheuermann is working with Nikon and Konica-Minolta/Sony.